Southside Towing is Sydney South’s Favourite Towing Service Here’s why. 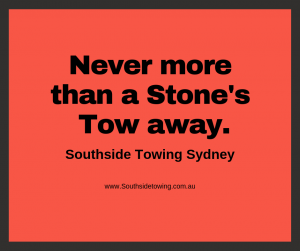 Southside Towing is a Towing Service that Sydney’s southern suburbs have embraced as their own. Several reasons for this. We station our Tow Trucks in the suburbs we service. This ensures we can get to you faster than anybody else can in the event of a breakdown or accident. At Southside Towing, we arrive when we say we will. Our goal is to be by our customers’ side in 31 minutes or less. Though the goal has been ambitious, we’ve achieved it in 99.3% of all emergency Towing Services we’ve provided in the last 8 months. Data true at the time of writing this post- March 2019. Depending on the type of breakdown or accident you’ve had, we send the right type of Towing Service Truck to you. If you drive a new or prestige vehicle, you may prefer us sending you one of our Flat-bed tow trucks. Flat-bed towing is very popular these days. They allow us to place your entire vehicle onto our trucks, so the wheels aren’t dragged along the road during the journey. This protects your vehicle from further damage. Southside Towing: what makes us different? A customer-focused Towing Service, we try to understand our customers’ needs so we can better service them – all the time. To make settlement as easy as possible for our customers, we make as many payment options as there are, available to them. These range from Credit Cards to Bank Transfer and EFTPOS. Soon we’ll be going into Mobile and Chip-based payments using Square. Need an Emergency Tow in Sydney’s South? Give us a call. Our teams at Southside Towing can be contacted on 0488 869 464. Alternately, email us using the Enquiry Form provided.